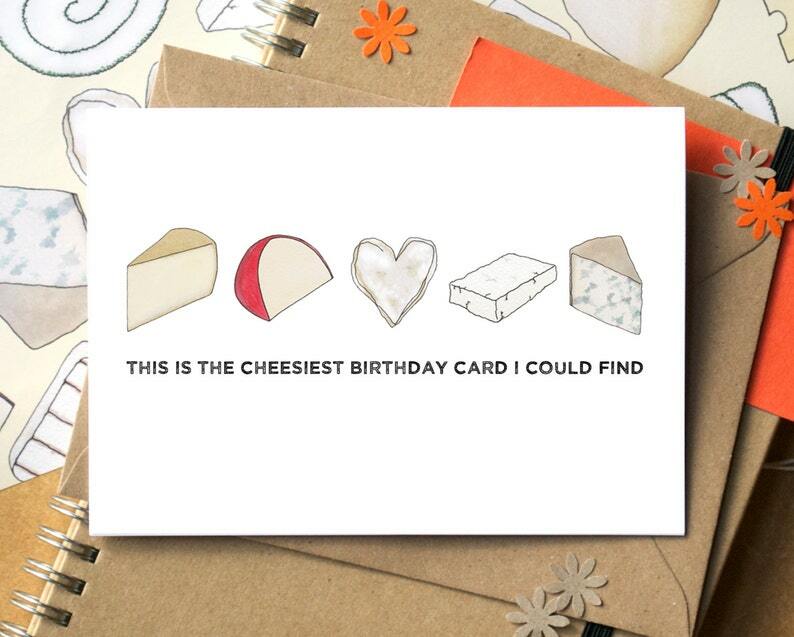 The cheesiest - and funniest - birthday card you'll ever find! Ideal for any cheese lover, and perfect for anyone who loves a pun. This card comes as one of the original cheesy designs, as a birthday card (please note that wedding, engagement and anniversary cards are all available but listed separately). Printed in the UK from my original design, the little cheese images were originally drawn by hand and coloured using watercolour paint. The card is blank inside for your own cheesy message. Printed on a crisp white card stock. Size C6 - approx 148mm x 105mm; brown recycled envelope slightly larger. I also offer a “send direct” service - where I will write the card of your choice and post it on to the recipient on your behalf. Great if you are running short on time, or if you are sending overseas. Simply purchase your choice of card along with this listing - https://www.etsy.com/uk/listing/125294142/any-becka-griffin-illustration-card - make sure you change the delivery address to that of the recipient, and you include your personal message. Smashing card just what I was after. I post out twice a week as a minimum, usually Monday and Wednesday/Friday (but if your order is time sensitive then please check first). Orders placed after 11am will normally be processed the following posting day. UK delivery is by First Class Royal Mail. Seconds and reduced items are usually posted Second Class. International delivery is by airmail and is not tracked as standard. Please allow three working days (from time of dispatch) for delivery in the UK, and 12 working days for international delivery, although orders will often arrive sooner than this. Please be aware that envelopes may vary slightly to those pictured - wherever possible I will supply an envelope as pictured. All images are copyright Becka Griffin Illustration Ltd and should not be reproduced without my explicit permission.